I really need to get myself a pacific northwest mushroom identification guidebook. I do not even have a good source online for identifying the mushrooms photograph when I am out in the woods like I do for wildflowers, and both truly fascinate me. This colorful mushroom really stood out along the path I was walking on. A smaller friend hung out in the background. Does anyone know what type of 'shroom it is? I think your woods is the land of fairy tales. Oh amazing. Sit down and write a book to all you see. This is a winner. Nice! I think you could make the most amazing story books for children. if you never wanted to go that avenue. Make then for your family, friends. My son made his first book and then sold them by mouth to mouth and gave away also. He had a good sales lady I. ha-ha. Extraordinary contrast of colours in these mushrooms. A magical sight. Wonderful colours. I love this autumn with its mushroom pictures. Such a bright red! I looked at a few Oregon sites for mushroom identification, but didn't see any so bright red, that have pores instead of gills. 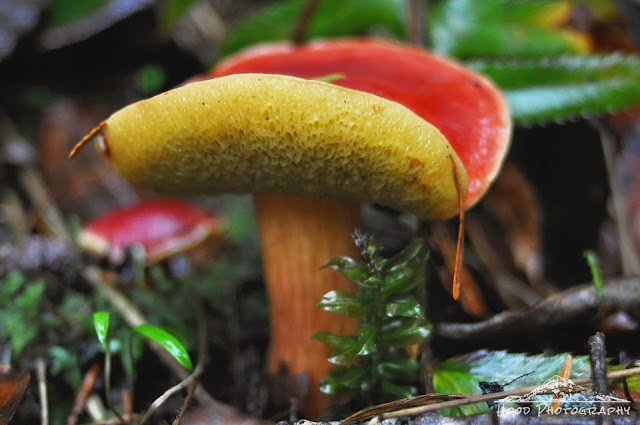 I have one Bolete in my yard, B. zelleri, with a black cap and red stem, but I couldn't find any this year. Beautiful and unusual looking mushroom. what a beautiful colour. I have seen only once a red colour mushroom.